I am getting in touch with my inner hippie lately or at least that is what everybody I know thinks when I mention hemp seeds or protein. The seeds are incredible on a salad! 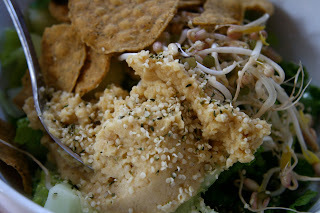 This one completely hit the spot with homemade garlicky hummus, home grown mung bean sprouts, romaine lettuce (sadly, not home grown) and Spicy Falafel Chips! 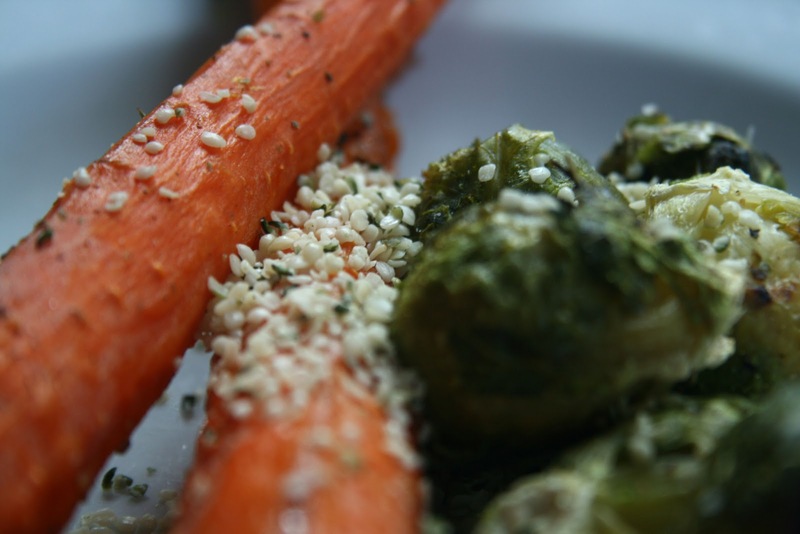 They give a great texture and nutty flavor to my roasted veggies. They also give a great nutritional boost to anything you put them on. 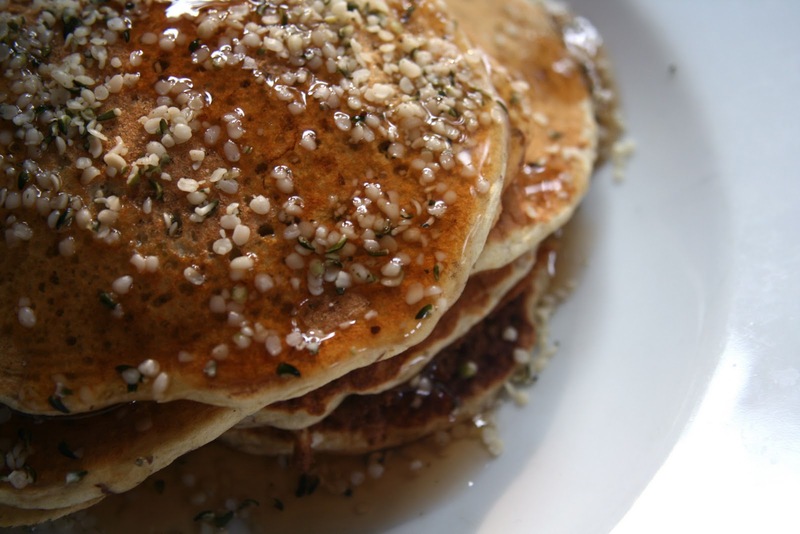 The flavor is a lot like sunflower seeds to me, so the flavor was very complementary to the banana bread pancakes. I am now putting them in and on everything! I don't typically do the protein powder thing. 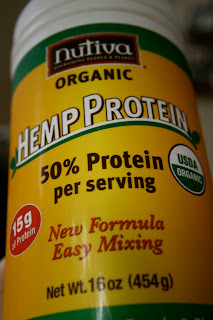 I just haven't really gone down that road yet, but after trying some vanilla hemp protein from Trader Joe's not too long ago, I thought I would give the Nutiva Hemp Protein a try. This one is very different. Not sweet at all. VERY earthy! What? I like earthy! 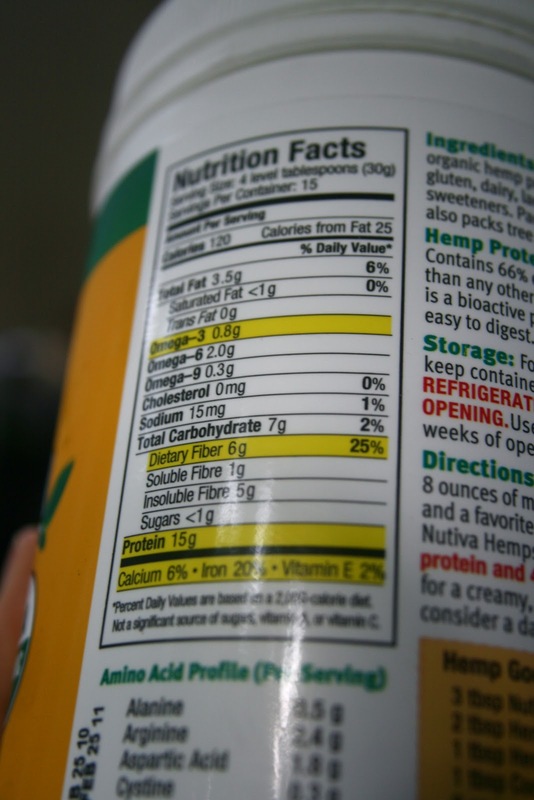 I am impressed with the nutritional breakdown on this, so I figured I would play around with it. I don't do smoothies either. I am not big on drinking my calories and it always leaves me missing something without being able to chew on my food. After making a fudge topping for my overnight oats with the vanilla powder, I got an idea to try this one in a little chocolate treat. Anyone who knows me, knows I am not a huge fan of chocolate. However, I have really fallen in love with these little chocolate bites. They are not super sweet, but they are rich and have the texture of fudge! I also like getting a good dose of amino acids, protein, vitamins and fiber in my treats! 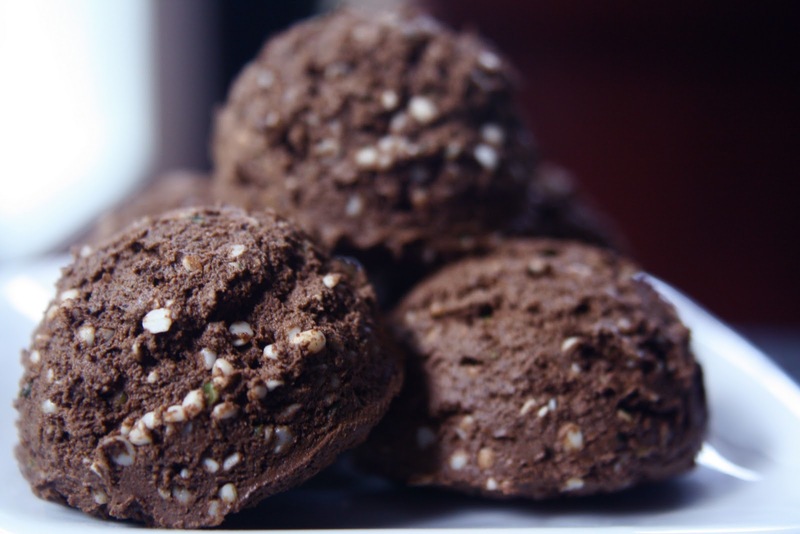 The antioxidants in these little treats is pretty impressive too thanks to all the cocoa extract! Hello healthy immune system! Stir everything together until combined. Then scoop it into individual bites and refrigerate. I do splurge on sugar and junk occasionally, but I do like being able to have sneaky treats. You know things that look bad for you, but are really so good for you (and tasty too)! I love that there's such few ingredients in them! They look delicious! 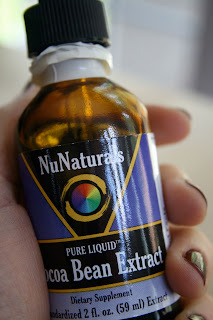 I have not tried any hemp product yet. Sometimes I feel so behind on the "to-try" list of mine. I need to hunt down that NuNaturals flavor though! Hope you had a great day!! I love hemp! 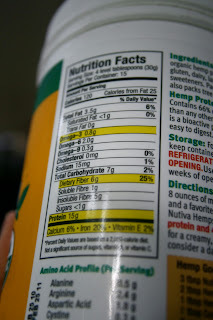 And I love Nutiva hemp powder! It's true it's one of the better ones out there, because it doesn't try to mask the taste. It's very simple and plain. It actually tastes like hemp! Great recipe. <3 Thanks so much! You're on the same page as my co-op - I just grabbed a magazine they put out and one of the headlines is "Hemp Hype: Why It's So Good." :P I've yet to get to it, though. Anyways - I've never tried hemp, either - and had no idea it was like sunflower seeds. After hearing that, though, I must give it a shot. I'm fairly sure my co-op stocks that exact same stuff. And the fudge bites look/sound great! I'm with you - I love "sneaky treats," too. Probably because half the time "real" treats are too sweet for me anyways! haha. Protein powder ebbs and flows in my pantry I guess you could say. Sometimes I'm drinking protein shakes everyday, then time like this summer I haven't really touched the stuff at all. Great recipe though! 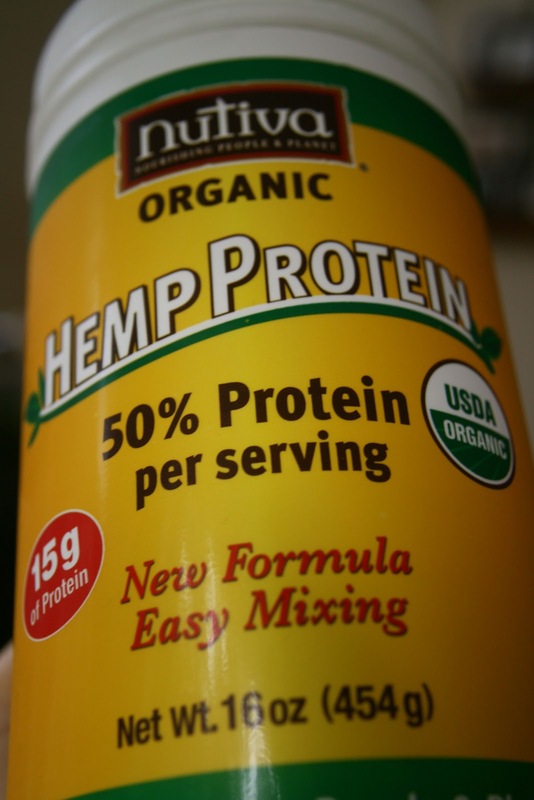 I've heard of hemp protein powder and tried it once before. Wasn't my thing. The hemp seeds though I would probably like since they complement other flavors and aren't the sole ingredient. Also good to know you can find them at TJs. I would buy this stuff by the case load if it got me high. Seriously. Matthew McConaughey would love you. I've never tried hemp seeds but you make them look really good! Those hemp fudge chocolate bites look amazing!!!! I am loving the recipe, very simple! I have never tried hemp seeds, I see them at the store but never bought them, I might be intrigued to now! Hope your day is great and your boys having a great week at school! I love all things hemp. I use the hemp protein + fiber and just found a way to pump it up using cocoa powder (and cinnamon!)! This spicy-chocolatey blend would taste great in those fudgey cocoa bites! Waffles with Oatmeal Ice Cream!